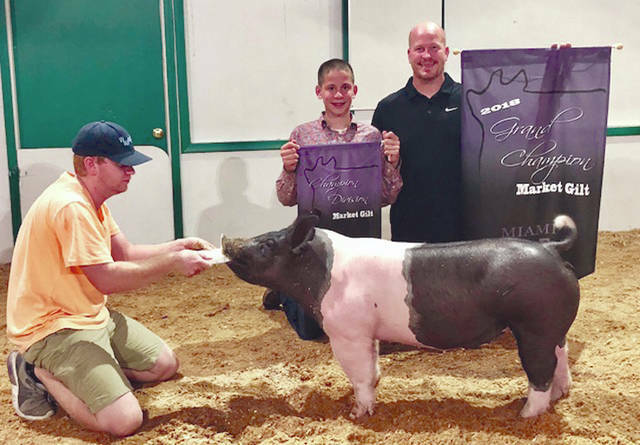 Provided photoJacob Roeth, 13 of Troy, and a member of the Frisky Critters 4-H Club, won Grand Champion Market Gilt. He is the son of Justin Roeth. 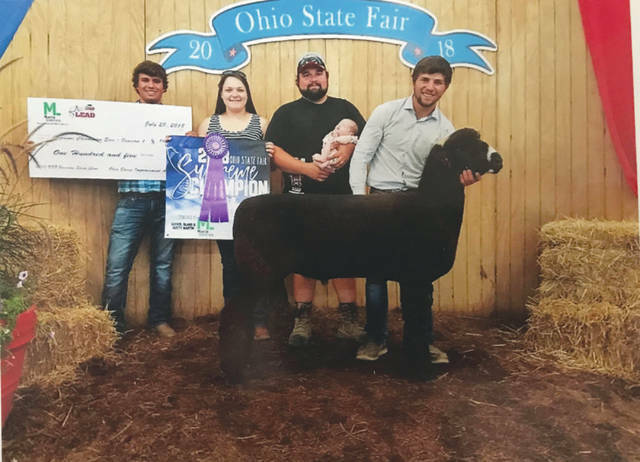 Provided photo Colin Tackett, 15, of Pleasant Hill, had Grand and Reserve Champion 6 Class Buck, Grand and Reserve 6 Class Doe, Grand Champion Single Fryer, Grand Champion Home Grown Meat Pen, Showman of Showmen, and the Buddy Ganger Outstanding Exhibitor Award. He is a member of the Rock N Rabbits 4-H Club. Provided photo Pictured are Kamron Paulus, holding sheep; Kodi Paulus, brother, holding his 5-month-old daughter, Hadley; Hannah Paulus, sister-in-law; and Jacob Hornberger, cousin. 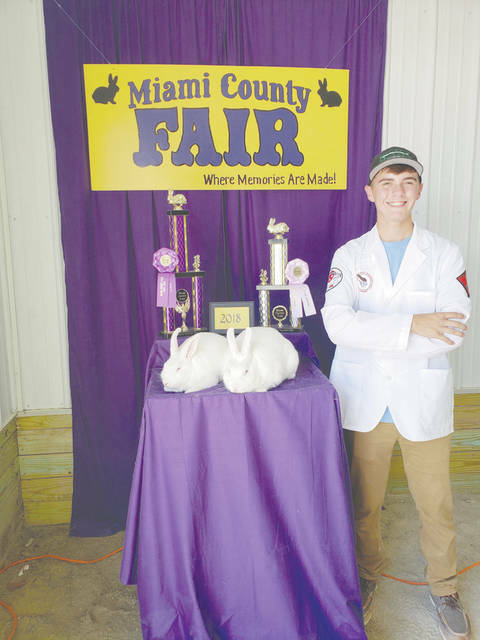 CASSTOWN — Kamron Paulus of West Milton ended his 4-H show career this year at the Ohio State Fair and Miami County Fair. At the Ohio State Fair with his Natural Colored Sheep, he had five first places, two second places, Champion Ram, Reserve Champion Ram, Champion Ewe and Supreme Champion Ram over all breeds. He was also Champion Senior Showman of Session 1. In Session 2, with his Polled Dorset Sheep, he had four first places, two second places and one third place and Best Headed Ram. He was also Champion Senior Showman. At the Miami County Fair, Kamron had four first places, three second places, Champion Ram, Reserve Champion Ram, Champion Ewe and Supreme Champion Ram over all breeds. With his Polled Dorsets, he had three first places, two second places, one third place, Champion Ram, Reserve Champion Ram, Champion Ewe, Reserve Champion Ewe and Supreme Champion Ram over all breeds. Kamron and his brother Kodi showed the Natural Colored Sheep in the open class show, and had nine first places, three second places, Champion Ram, Reserve Champion Ram, Champion Ewe, Reserve Champion Ewe, Champion Flock, Reserve Supreme Champion Flock over all breeds, Supreme Champion Ewe over all breeds and Supreme Champion Flock over all breeds. They also showed the Polled Dorsets in the open show and won six first places, three second places, one fourth place, Champion Ram, Reserve Champion Ewe and Champion Flock. In Sheep Showmanship, Kamron won first place, winning the Showman of Showman trophy. Kamron also showed two Market Ducks that placed first and second place in class. He had the Champion Market Duck that sold in the Sale of Champions and set a new record, selling for $4,250. His Reserve Champion Market Duck sold in the Sale of Champions last year, setting a record of $4,100. Kamron is the son of Scott and Julie Paulus of West Milton, and grandson of Mark and Debi Bell of Casstown, and Dave and Virginia Paulus of West Milton. https://www.tdn-net.com/wp-content/uploads/sites/21/2018/08/web1_Tackett.jpgProvided photo Colin Tackett, 15, of Pleasant Hill, had Grand and Reserve Champion 6 Class Buck, Grand and Reserve 6 Class Doe, Grand Champion Single Fryer, Grand Champion Home Grown Meat Pen, Showman of Showmen, and the Buddy Ganger Outstanding Exhibitor Award. He is a member of the Rock N Rabbits 4-H Club. https://www.tdn-net.com/wp-content/uploads/sites/21/2018/08/web1_Paulus.jpgProvided photo Pictured are Kamron Paulus, holding sheep; Kodi Paulus, brother, holding his 5-month-old daughter, Hadley; Hannah Paulus, sister-in-law; and Jacob Hornberger, cousin.